On April 3, 2019, New Mexico Governor Michelle Lujan Grisham signed Senate Bill 96 (SB 96), the “Criminal Offender Employment Act” which is a measure that will “Ban the Box” by prohibiting private employers in the state from inquiring about a job applicant’s arrest or conviction history on an initial employment application, according to a press release on the Governor’s website. 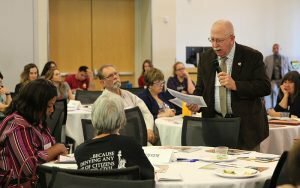 “Senate Bill 96, a bipartisan piece of legislation that would remove the so-called criminal history ‘box’ from job applications, allows New Mexicans a fair opportunity at employment. It is our responsibility to ensure that we create a pathway for individuals to contribute to our economy and to our communities,” Governor Lujan Grisham stated in the press release about the criminal justice reform initiatives. “Ban the Box” is a growing nationwide movement that seeks to advance job opportunities for people with prior criminal convictions by eliminating any inquiry into the criminal history of candidates on job applications, specifically the checkbox that requires candidates to disclose their criminal history. As of April 2019, more than 150 cities and counties, as well as 34 states, have passed Ban the Box laws. In addition, twelve states – California, Connecticut, Hawaii, Illinois, Massachusetts, Minnesota, New Jersey, New Mexico, Oregon, Rhode Island, Vermont, and Washington – as well as the District of Columbia have passed Ban the Box laws for private employers. 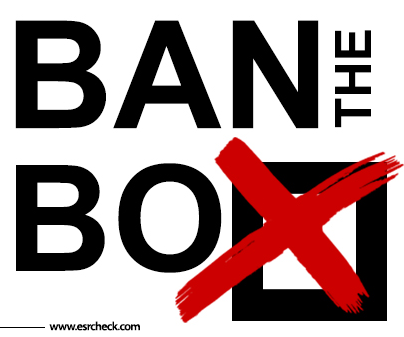 More ESR News blogs about the Ban the Box movement are available at www.esrcheck.com/wordpress/tag/ban-the-box/. Employment Screening Resources® (ESR) also offers a complimentary white paper entitled “Ban the Box Now More than the Exception for Employers when Screening” along with the “ESR Ban the Box Resource Guide for States, Counties & Cities” to help both public and private employers understand their responsibilities if they live in one of the many areas where Ban the Box laws have taken effect. Employment Screening Resources® (ESR) – a leading global background check provider – offers employers a Ban the Box Resource Page the contains complimentary white papers, infographics, and an interactive map updated with the latest Ban the Box laws. The ESR Ban the Box Resource Page is available at www.esrcheck.com/Legislative-Compliance/Ban-the-Box/. prohibited unless written authorization is first obtained from ESR. There’s a push to change laws to permit both criminals serving time and ex-criminals the right to vote. Guess which party is pushing the most for these legal. The Illinois House rejected a “ban-the-box” bill that opponents said could make college campuses more dangerous. Bill would have barred college, university admissions offices from asking about applicants’ criminal records.